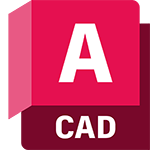 Generate design ideas in almost any form imaginable with AutoCAD design features. Push/pull faces, edges, and vertices to model complex shapes and add smooth surfaces. Solid, mesh, and surface modeling give you flexibility and control when designing in 3D. The navigation bar includes frequently used tools such as steering wheels, view cube, and show motion, as well as pan, zoom, and orbit.